Sophocles’ classic story about the ultimate dysfunctional family (dad sacrifices eldest daughter to the Gods; mom murders dad and banishes kids; kids come back and kill mom) has had many interpretations (The Metropolitan Opera is premiering its version of Elektra this April), but I am reasonably certain that – until the U.S. premiere of performance artist Ann Liv Young’s radical Elektra at New York Live Arts on 1/20 – none has included an adorable, diminutive pot-bellied pig -- but why? Said pig made his entrance with the rest of the cast, and stayed throughout Act 1, rooting about in the circle of sand that formed the stage. The human performers ignored him, did a series of dances to a backdrop of pop music, tumbled in the sand with a chair, wrestled in the sand without underwear, and ripped off each other’s clothes. 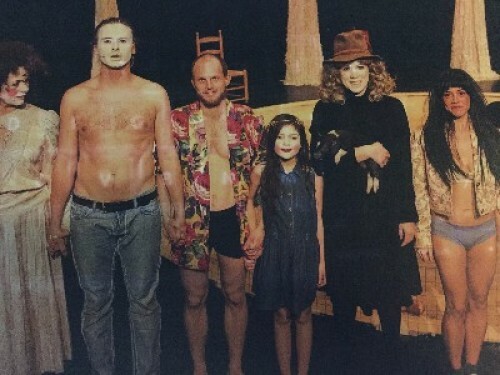 By Act 1’s end, mother, son and daughter are naked, and pose in a series of tableaus that terminate with son, Orestes -- sister, Elektra, by his side -- holding his severed mother’s head. Problem was, where was the story? Perhaps I missed it: I spent my time laughing at the pig. Gee, thank you, I’ll pass. And frankly, I wish I’d passed on this performance. Rule #1: If you truly have something to say, do not distract your audience with adorable animals or children. Young did both: The pig in Act 1 and her daughter in Act 2. Conclusion: If Young’s Elektra actually had a point, which I doubt, I missed it -- but I really did like that little pig!